Has OncoCyte Changed How We Will Diagnose Cancer in the Near Future? OncoCyte Corporation (NYSE: OCX) focuses on the development and commercialization of novel and non-invasive blood and urine (liquid biopsy) diagnostic tests for the early detection of cancer. OncoCyte’s is developing a confirmatory, non-invasive liquid biopsy test intended to facilitate clinical decision making in lung cancer diagnosis. The diagnostic is being developed as an intermediate step to confirm the absence of cancer between imaging modalities (LDCTs) detecting suspicious lung nodules and downstream invasive procedures that determine if the nodules are malignant. As molecular diagnostics evolve from tissue based to liquid biopsy based, fewer downstream procedures will be required resulting in cost savings, earlier diagnosis and decreased risks to the patient. OncoCyte’s portfolio of pipeline products detect biomarkers that are associated with specific types of cancer (lung, breast and bladder) to help physicians by confirming false positives to improve the standard of care and reduce overall health care spend. Recently the company conducted a R&D Validation study demonstrating the accuracy of the Company’s DetermaVu™ liquid biopsy test for lung cancer. On Tuesday, January 29, 2019, the stock ran up over 250% on volume of about 36 million shares, compared with the full-day average volume of about 30,350 shares. The company said the DetermaVu study demonstrated sensitivity of 90%, which is the percentage of malignant nodules that are correctly identified, and specificity of 75%, which is the percentage of benign nodules correctly identified. OncoCyte said in a statement. “DetermaVu™ has the potential to dramatically reduce U.S. healthcare costs by billions of dollars each year by eliminating unnecessary biopsies, which, according to a recent Medicare study, cost on average $14,634 each.” The company expects DetermaVu to be commercially available in the second half of 2019. In practice, physicians could use a simple DetermaVu™ blood test to determine whether or not a patient’s lung nodule should be biopsied for cancer. If the DetermaVu™ test indicates a benign result, the patient can be monitored without a biopsy, eliminating the cost and safety risks of an invasive procedure. With 75% specificity, physicians could use DetermaVu™ to eliminate up to three quarters of unnecessary biopsies and their associated complications and deaths. These reduced costs and improved patient outcomes highlight DetermaVu™ ‘s value proposition for payers such as Medicare and health insurance companies. 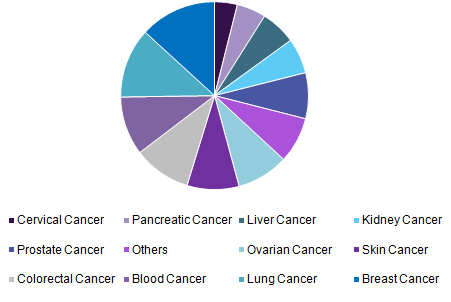 According to Grandview Research, the global cancer diagnostics market size was valued at USD 124.0 billion in 2016 and is expected to grow at a CAGR of 7.2% over the forecast period. Growing prevalence of oncologic cases, constant technological advancements in diagnostics, and increasing demand for effective screening tests are some of the prime factors spurring the demand for screening tools across the world. In addition, rising awareness and supportive government initiatives are some additional factors that are anticipated to boost the growth of the sector during the forecast period. Although various screening procedures, such as lab tests, imaging, and endoscopy, enable disease detection at an early stage, there are certain risk factors posed by medical imaging, such as excessive radiation exposure and the administration of fluorescent and barium contrast media in imaging and endoscopic procedures, that cause several adverse effects such as nausea and diarrhea. In addition, the cost entailed in performing diagnosis is relatively high. Cancer is one of the leading causes of deaths across the world, which is attributed to the escalating prevalence of the disease. Therefore, healthcare professionals are focusing on the development of effective diagnostic and treatment solutions to check the prevalence level. Early detection increases the success rate of treatment regimens. As a result, healthcare agencies and market players through various awareness programs are promoting routine checkups. OncoCyte Corporation focuses on the development and commercialization of novel and non-invasive blood and urine (liquid biopsy) diagnostic tests for the early detection of cancer. The company is developing diagnostic tests using genetic and protein markers expressed in various types of cancer. It develops diagnostic tests based on liquid biopsies using blood or urine samples for detecting lung, bladder, and breast cancer. The company was founded in 2009 and is based in Alameda, California. OncoCyte Corporation is a subsidiary of BioTime, Inc.
OCX is a development stage company and has not yet generated revenue. The company ended Q3 2018 with $10,821,000 in cash. Continuing progress in product development could be a catalyst for the company shares. They have incurred operating losses since inception and do not know if they will attain profitability. They may need to issue additional equity or debt securities in order to raise additional capital needed to pay operating expenses. The reduction of sales and marketing staff as part of a cost savings plan could delay their ability to commercialize DetermaVu™ and may result in alternative options for commercialization. 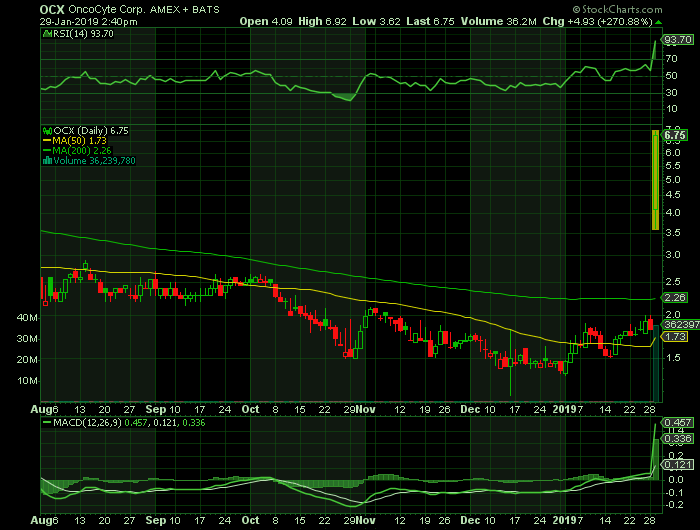 At $6.75, OCX shares are trading above the 50 DMA and 200 DMA od $1.73 and $2.26 respectively.